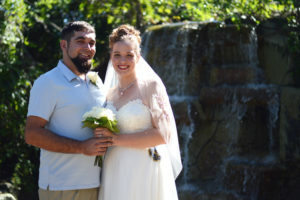 We are happy to announce that Ashley Nicole Wike, originally of Travelers Rest, South Carolina, and Kyle Christopher Farrell, originally of Griswold, Connecticut, were united in marriage before family and friends on Saturday, October 13, 2018 in the Ivory Chapel at Wedding Chapel by the Sea. Janet Oniello officiated. Ashley is the daughter of Kevin Adams Wike & Loretta Jeannine Upton and granddaughter of William “Woody” Wike (deceased) & Peggy Ann Wike (deceased). Kyle is the son of Christopher John Farrell and Sheri Lynn Wolinski & Paul Osric Wolinski (Step-Father) and grandson of Frank John & Peggy Ann Deluca Farrell, Stanley Allen Schroeder & Karen Lynn Schroeder (deceased) and Stephen Wolinski (deceased) & Ruth Ann Wolinski. Please join us in wishing Kyle and Ashley a lifetime of love and happiness.